Lorenzo Dow (1777-1834), from Connecticut, USA, took eccentricity to a new level. From childhood he knew sweeps of emotion beyond his fellows, higher highs and deeper lows. His conversion experience was unusually dramatic too: in a dream, he was carried off to hell by a demon, and cried to God that he deserved it – but begged for mercy. He knew amazing peace and joy and woke up loving God. At 21, he was accepted as a circuit preacher by the Methodists. Later he was an independent evangelist. He quickly gained a reputation, both for his appearance and his methods. Lorenzo usually had just the clothes he stood up in, which he wore until they were so unsightly that some person in the audience would donate a replacement – which might not be the right size. He had a beard down to his chest and never combed it. He didn’t always wash. After his death, one obituary said: Who will forget his orangutan features, his outlandish clothes, the beard that swept his aged breast, or the piping treble voice in which he preached the Gospel of the Kingdom. He and his wife Peggy embraced poverty for the gospel’s sake. They would often sleep rough in the woods. Peggy wrote a journal of these times, later publicised as Vicissitudes in the Wilderness (available online here). Dow’s preaching mannerisms were a revelation. A generation before, the great open-air preacher George Whitefield was passionate but serious and measured. Lorenzo Dow shouted, screamed, wept, begged, insulted, and challenged people’s complacent beliefs. He told stories and jokes. It is recorded that he could hold an audience of 10,000 spellbound. He gained the nickname “Crazy Dow” and happily accepted it. Lorenzo himself wrote a retrospective account of his many experiences, The Dealings of God, Man, and the Devil (available online here). He had a keen eye for the theatrical. He loved to turn up at a public event, go to the centre or on to the stage (uninvited) and announce loudly that he would preach on that spot in one year’s time. One famous episode took place in Westminster, Maryland, and he repeated it elsewhere. Seeing a boy with a trumpet, he enlisted his help: after the start of a service in a meeting hall, the lad was to climb an adjoining tree and wait for a signal. Inside, Dow preached a “fire and brimstone” message. In a great crescendo he cried: ‘If Gabriel were to blow his trumpet announcing the day of Judgment is at hand, would you be ready?’ It was the signal. The boy blew the trumpet! People screamed and rushed to the front to seek mercy and make peace with God. The boy made a quick getaway! 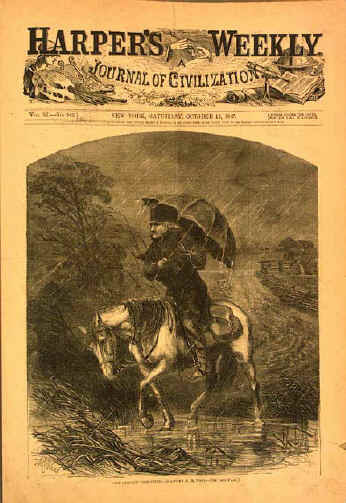 Contemporary print of Dow preaching. Note the trumpeter behind the stage. His engagement to Peggy was suitably unusual. 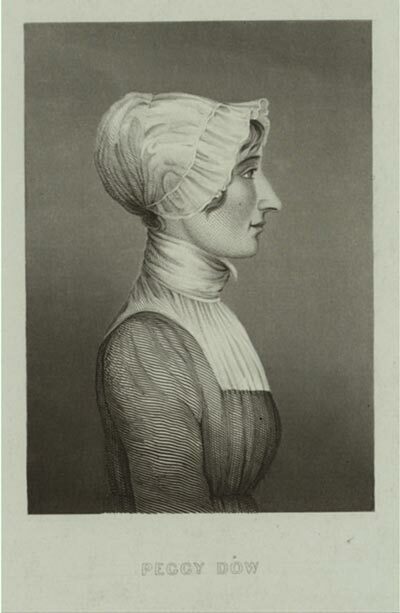 He would marry her, he said, but “if you should stand in my way in the service of the gospel, I will pray to God to remove you!” Stout-hearted Peggy said yes nevertheless and they married in 1804. She accompanied him on many of his travels, which were long and arduous. They would camp in the woods without a tent, hearing wolves but trusting God. This they did out of love for the hundreds of settlers, born and bred in the wilderness, and now adult, who had never seen a preacher. One record exists of Dow arriving at a village in Alabama: his pantaloons were worn through, and for several hundred miles he had ridden without a cloak, for he had sold it. He was barefoot and his umbrella was held by just three spokes. Small wonder that Peggy entitled her autobiography Vicissitudes in the Wilderness. When Peggy died, Lorenzo married Lucy, who was every bit as feisty as he: at their wedding she promised “to be a thorn in his flesh and a sword in his side”! Despite their grinding poverty, however, Dow made a point of refusing lavish gifts from well-wishers, accepting only the bare essentials. Such a lifestyle took a toll on his health. He had asthma and malaria and, like the great Methodist circuit preacher Francis Asbury, could not stand for a whole preaching but had to lean on something. Dow was a phenomenon, a source of entertainment as well as awe. Many a child was christened Lorenzo in his honour. But he also provoked opposition, especially in southern states, where he opposed slavery. He was sometimes pelted with stones, eggs, and rotten vegetables. That never stopped him; he simply walked to the next town and gave the same sermon again! At Jacksonborough, Georgia, he was abused and attacked so badly that, on leaving, he “shook off the dust from his feet” [Matthew 10:14] and cursed the place. Within a few years, all that was left of Jacksonborough was the home of his hosts – the rest had been abandoned and fallen into ruin. 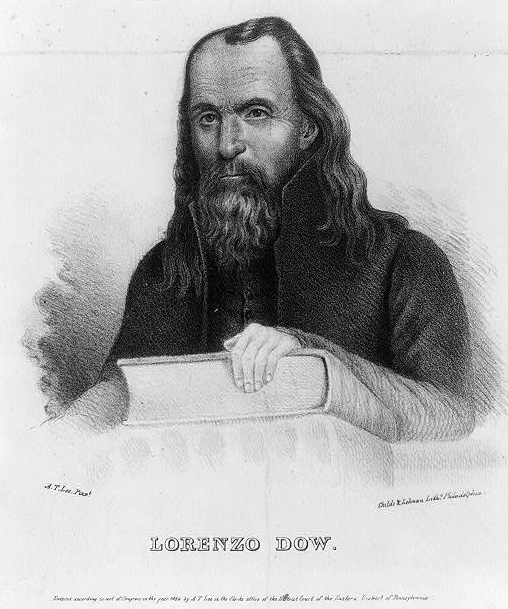 In all, Dow made three trips to Britain, where he longed to preach the gospel to Roman Catholics. He was received as something of a curiosity but his preaching was respected everywhere. 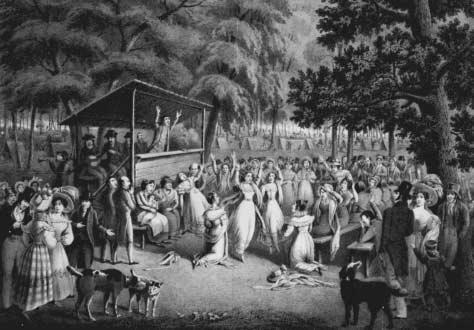 He introduced a group of Methodists to the American-style “camp meeting“, where revivalist preachers spoke to crowds in giant open-air congregations, which might last 3 days. As a result, Hugh Bourne and the Primitive Methodists began holding them in England. His written output is worth a look – an unvarnished primitive Methodism quite rare at the time. A little rich for my blood, personally. Thanks for the link, John – nice! I shall delve.